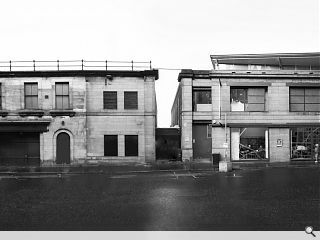 Doolan prize-winning architects Reiach & Hall have been appointed to lead a refurbishment of The Fruitmarket Gallery in Edinburgh, seeing off competition from 6A, Carmody Groarke and Page\Park. Proposed works include expansion into a neighbouring warehouse to provide a new space for artist-led installations, performance and collaboration. Existing galleries will also be renovated, enabling new learning and participation facilities to be introduced. The Fruitmarket Gallery has been seeking to expand for over a decade, scaling back its ambitions in that time to meet funding realities. The project is now expected to cost around £3.7m with just over 25% of that total still to be raised. Shocking funding bias towards Edinburgh elite. More public money for a toffs playground, swilling champagne and noshing on truffles. Another example of Holyrood showering the East with diamonds and rubies while the West crumbles into dust. Just thought I'd get in there first. Urban Realm becomes more and more like the comments section of the EEN and Evening Times god help us. Creative Scotland who are the main public fund source for Fruitmarket spends almost exactly as much on Glasgow's CCA which is closest equivalent type of gallery in west. Ignorant conspiratorial confirmation bias is chippieness and scapegoating for whatever ails a soul - There's a serious debate to be had about arts funding but this ain't it. The issue here is false equivalence. Auld Reekie demands and gets -- sometimes in fact it gets more -- the same level of funding as goes to Glesga and the west. The issue is that there are twice as many people in the West / Glesga are there are in the East / Auld Reekie and no amount of gerrymandering of the City region boundaries will change that fact. Then there is the issue that Auld Reekie does not shares it abundance with its region while Glesga does. Why does this gallery need to expand? If it is growing then surely it can fund this growth commercially? Interesting comparison with the CCA -- surely its funding should be greater to reflect its bigger audience? Holyrood and its garden suburb are the great vampire squid of our locality and our generation. One thing about our friends in the east -- they will never knowingly refuse a free public sector hand-out. Take absolutely nothing away from R&H, but I'm astonished that Richard Murphy Architects didn't win this one. Surely Edinburgh attracts more funding because it attracts a helluva lot more tourists than The Glasgow? Which seems fair enough. Here we go again -- the Moscow Metro debate 40 years on. Do we just reinforce what we have got or do we try and expand the offer to new opportunities? Do we spend public money to suit the needs of today's tourists or do we spend public money to meet the needs of the public / electorate? Auld Reekie is overheating as the rest of the country endures an ice age -- should we not spread the wealth rather than reinforce existing inequalities? The Scottish Government spent £382m on the Commonwealth Games in Glasgow. Huge sums also went into Kelvin Hall, Riverside Museum, and the SSE Hydro, and the Government has promised huge sums for the Buchanan Galleries project. The cash for the Fruitmarket is a drop in the ocean compared to the money thrown at Glasgow. FBOT is that you Big Chantelle? I'm glad we have a new conspiracy theory to play urban realm bingo with. Why not Richard Murphy Architects who designed the ‘original’ gallery? Allegedly Mr M did all he could to torpedo the previous Hoskins scheme. Doubt that endeared him to the Fruitmarket. Disappointing that smaller/younger practices don't get a look in. What does the RIAS do for the small firms! !